The Modelling News: Brett builds & back-dates the Vietnam Chaffee from Bronco - PT:I construction..
Brett builds & back-dates the Vietnam Chaffee from Bronco - PT:I construction.. 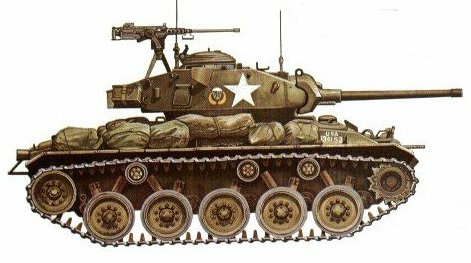 The M24 Chaffee was an American light tank designed in 1943 to replace the M5 Stuart. 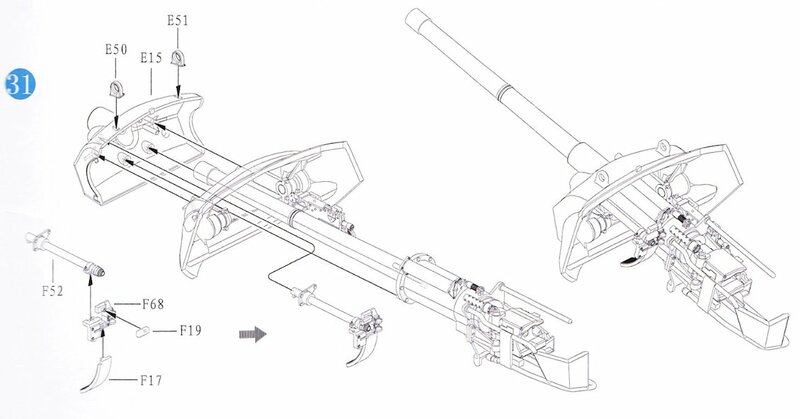 It was a new design using torsion bar suspension, though using the tried and tested drive train of the M5. The combat weight was 18 tons and the armour was up to 38mm thick. Armament was a lightweight 75mm gun, with 2 x .30 Browning machine guns. Powered by a 220 bph Cadillac 44T24 petrol engine, the M24 had a speed of 56km/h. 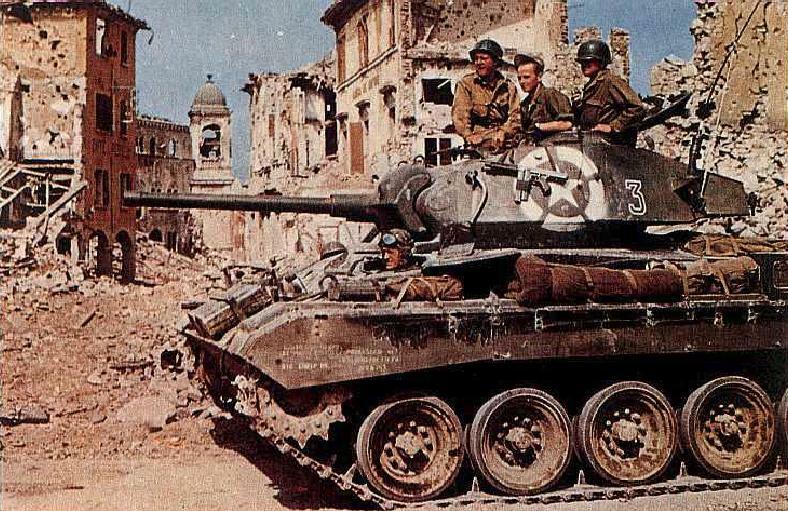 After the end of WWII many surplus tanks were passed to allies, and France received a number of M24's. Some of these were sent to Indo-China, now Vietnam, to fight the Communist Viet Minh. The tanks gave good service in the harsh jungle conditions. 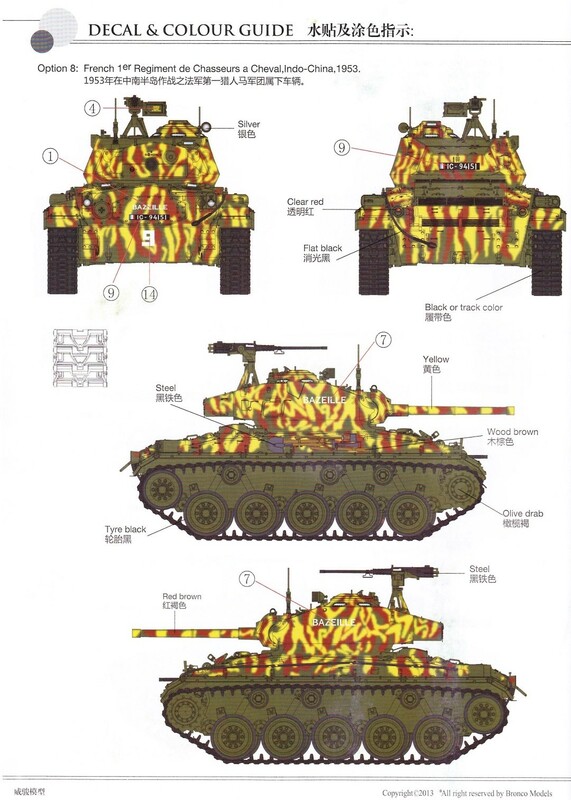 They were used mainly for infantry support and mobile artillery. 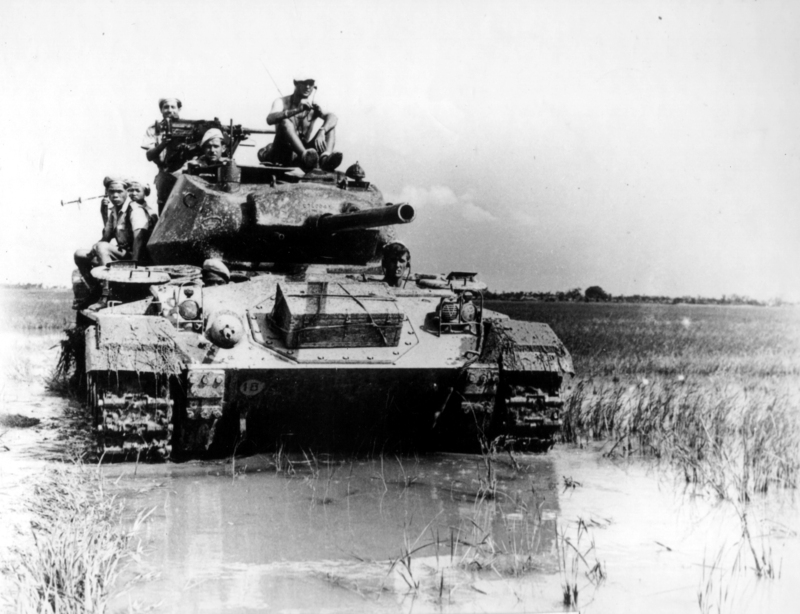 Ten tanks were air lifted to the fire base at Dien Bien Phu in March 1954 to try and stop the Communist advance on Laos, but after a two month siege the base was overrun by a vastly superior Viet Minh Army. The French abandoned Indo China shortly afterwards. Other French M24's served in the French colony of Algeria. This is Bronco’s fifth variation release of their M24 Chaffee kit. It was preceded by a “US Army NW Europe 1944-45” (CB35069), “British Army” (CB35068), “Post-War Asian Service” (CB35072) and a “US Army Korean War” (CB35139) releases. Opening the box it is evident there are a large number of parts included in this kit. Approximately half the sprues are for two different track options. Also included are some very nice individual slide-mould styrene parts, one sprue of clear parts, one brass photo-etch sheet, a length of nylon cord (for a tow cable) and a decal sheet. Unfortunately unlike the box art picture and in a couple of previous editions, no crew figures are included. The instruction booklet is 26 pages with 42 steps. Decal options with this kit are as the box suggests, French Indochina 1953 (8 options), mostly standard olive drab finish but a couple in camouflage. First impressions, the quality and detail of the kit are excellent. This is my first Bronco kit I’ve built and my first armour subject for a number of years. It’s impressive how good the moulding technology and kit options have become for these armour kits. I looked forward to getting into it. I had a sheet of Bison Decals of US Army Korean War M24s I wanted to use and this boxing of the kit gave me all the part options I needed. One scheme I liked was the 187th Airborne Regimental Combat Team at Yong-dong-po, Korea, April 1951. It is standard US olive drab finish with white stars but the tank’s turret carried an Airborne crest of a white parachute with yellow gold wings. It also had a pair of angry eyes on the mantlet above the main gun which looked cool. This would be the subject of this build. I decided to get the task of cutting all those individual track links out the way first. As mentioned earlier, there are two track options are provided in the kit. The earlier all-steel T72E1 and the later T85E1 track with rubber chevrons. This French Indochina edition of the kit utilises either type depending on the marking options chosen. If you choose to build a different scheme other than the box options then you’ll need to check you references. The Bison Decal sheet tells me to use the all-steel T72E1 track for my Korean War tank. The tracks consist of individual links that click together to give that ‘work-able’ track action. The instructions tell me I’ll need 75 for each side. I would later finds out that is an error in the instructions. 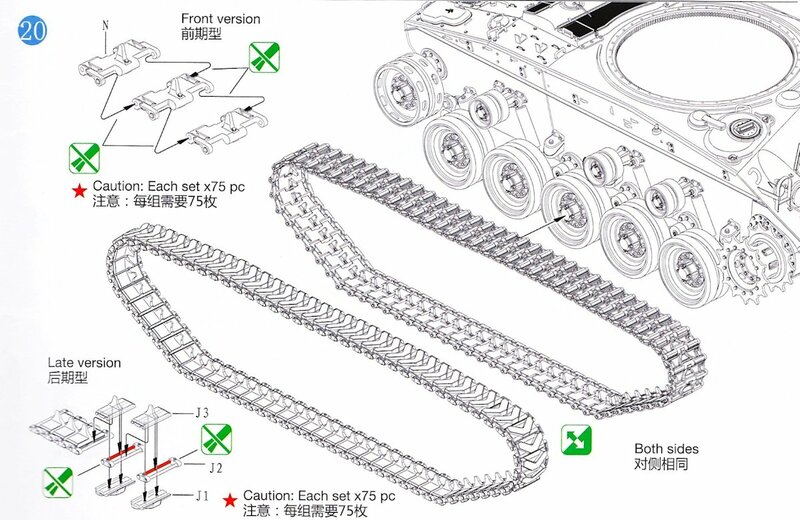 For the T72E1 track, 73 links will be needed. 75 are needed for the T85E1 track. Each T72E1 track is attached to the sprue in three places which needed only a little clean up. Linking the tracks together was fairly straight forward; click, click, click. I grouped them in 10’s to make the count easier. Detail either side of the track is nice and matches my references. The completed tracks were set aside and I then moved onto the wheels. The instructions have you building only half the wheels at a time, building up the right side of the hull and then the left. But the road wheels, return wheels, drive sprockets and idler wheels are identical for both sides, so I assembled them all at the same time. The road-wheels compose of four main parts: the inner and outer wheel hubs and outer rims. This has the benefit of hiding any sinkholes from the injection moulding. Detail is quite nice and includes the ‘Firestone’ manufacturer’s name on the wheel rim. Bronco utilises a pin in each wheel which then glued into a socket on the suspension swing-arm. The pin inside the wheel needs to move, so the builder needs to be careful with the glue. An outer hub cap covers the pin recess on the wheel hub. The main part of the drive sprocket and idler wheel are done using slide moulding which allow for a single part which includes the lightening holes. The idler wheel utilises a separate outer and inner rim ring to complete the assembly. It’s not completely clear in the instructions but this rim needs to be slightly recessed in the wheel and not flushed to the outer edge. Again, a hub cap and a pin complete each idler wheel assembly. 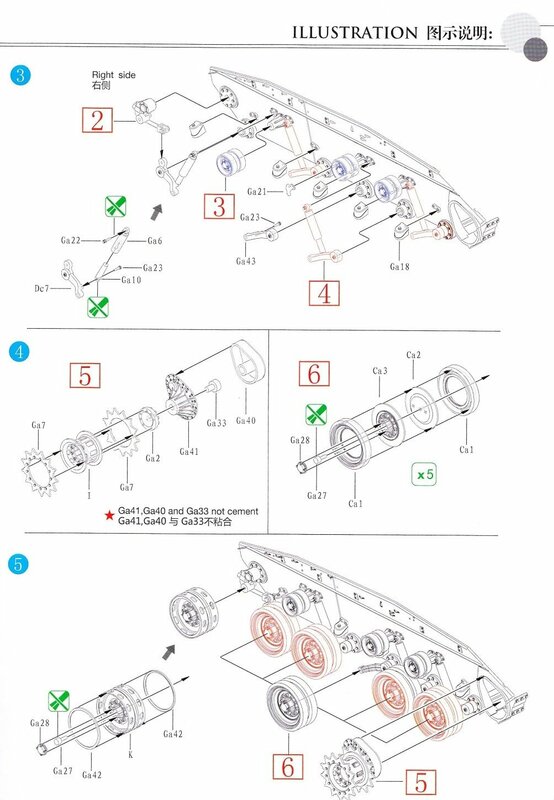 Each drive sprocket consists of 7 parts. Two options are provided for the inner and outer toothed rings in the kit but the instructions only tell you to use one of them (Part Ga7). 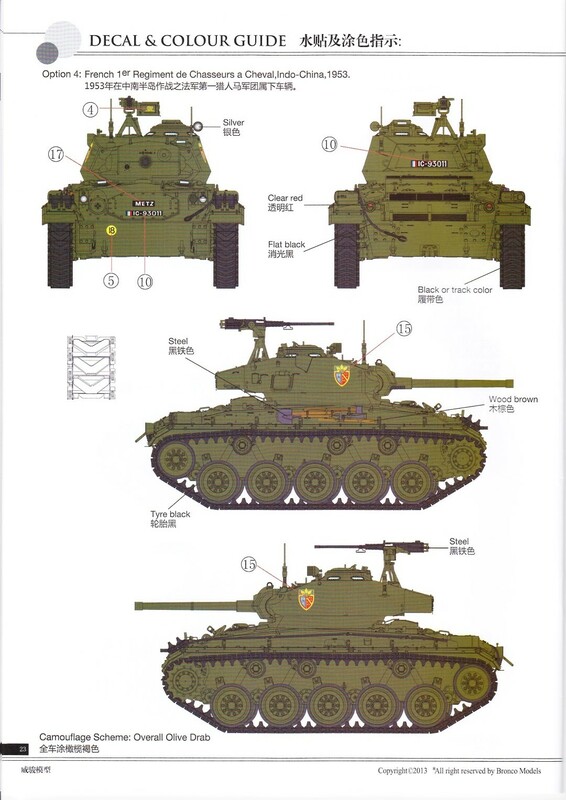 Looking at my references and images found on the internet, I think part Ga7 is used with the T72E1 track and part Ga8 is used with the T85E1 track. The toothed drive sprocket parts are sandwiched together and the inner hub is inserted. Make sure the hub lines up with the locator pins. Again an axle pin is used to attach the sprocket to its drive housing and to allow rotation, so be careful with the glue. Similar to the road wheels, the return rollers come as two halves, with the same pin and hub cap arrangement. This is probably the hardest part of the kit, assembling the working suspension. Torsion bars are inserted into the lower hull and fit within a slot. They are glued only at the far end to anchor them. A cover is then glued over each pair of torsion bars to keep everything aligned. This will also keep the suspension swing-arms at the correct angle when fitted later. As previously mentioned, the kit instructions have the assembly of the lower hull starting on the right side then the left. The suspension swing-arms are left and right handed, so it’s important to work on only one side at a time so not to mix parts. The shock absorbers come next. Each consists of a hollow cylinder and a movable piston rod. The piston rod gets attached to its corresponding swing-arm by a glued pin, while the cylinder parts get pinned to the hull. 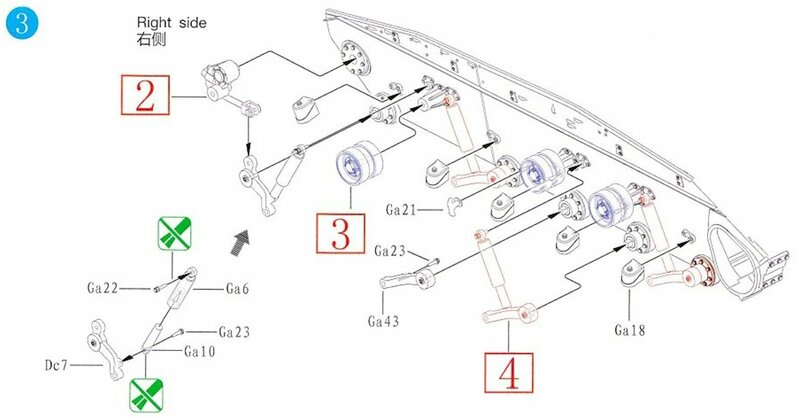 The idler wheel suspension assembly has a few more parts. Again very important to note where parts need to remain glue free otherwise the suspension won’t work. At the same time as assembling the working suspension, the instructions have the lower front hull being attached. Two options are provided here; one with crew boarding steps, the other with bulldozer mounting pads. So again, important to check which version your build subject has. Not for the faint hearted, Bronco gives you very small brass photo-etched individual numbers to be used as casted hull numbers on the inside of the drive housings. Had to give my eyes a rest are doing those. The lower front hull part was attached to the main hull using Tamiya extra thin liquid cement. The slower curing time allowing me to ensure correct aligned the two parts so that the drive sprocket housings will fit cleanly. The assembly then moves onto the driver’s windscreen and the headlight guards. The driver’s windscreen could be assembled in the up or stowed position. I left the clear part off the driver’s windscreen until the painting was completed. The head light guards are provided in both brass photo-etch and in plastic. The photo-etch part is utilized with a template to form the brass into the guard. However, I didn't have much luck with it and had to fall back to using the plastic light guards. We now move on to the upper front hull plate and fitting of the transmission access cover and a few hand-holds and lift rings. The windscreen and headlight guard sub-assemblies could now be attached to the upper front hull plate. At this point a forward firing .30-cal machine gun is fitted or not, depending on your version being built. Alternate parts are provided to blank off the gun port. Unfortunately no driver compartments, even minimalistic ones, are included in this kit. The engine deck comprises of seven separate engine grills and access panels just like the real thing. Each is treated as a small sub-assembly, some with very small details. Photo-etched screens and fixing brackets are included for some of the engine grills. The small brackets are difficult to install and may have been better served being moulded into the plastic part. The individual engine deck panels also have the benefit of the engine compartment being able to be opened as in a diorama. However, you’ll need to rely on your scratch building skills or you’ll need an aftermarket set, as no interior parts are included. However, this is one thing I like about this kit … it gives you the option. There are two rear hull plates included on the sprues, however only one (Da 7) is utilised in this kit and it includes a wire mesh stowage basket. 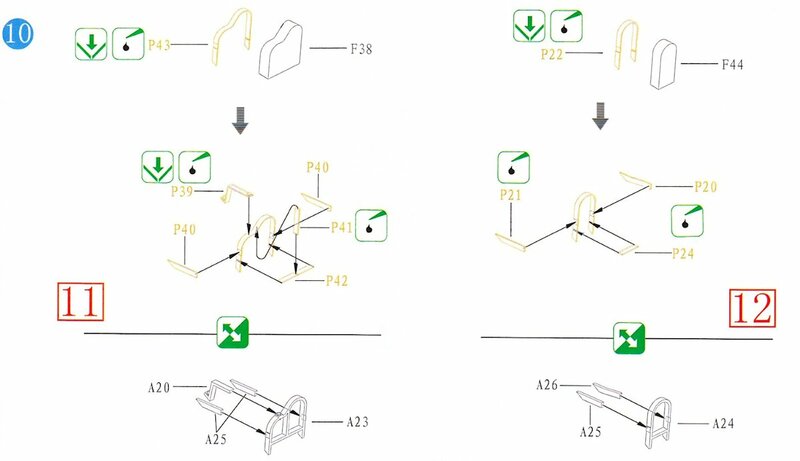 The kit also includes parts for a fold-down stowage shelf with side hinges, but no instructions on assembly. 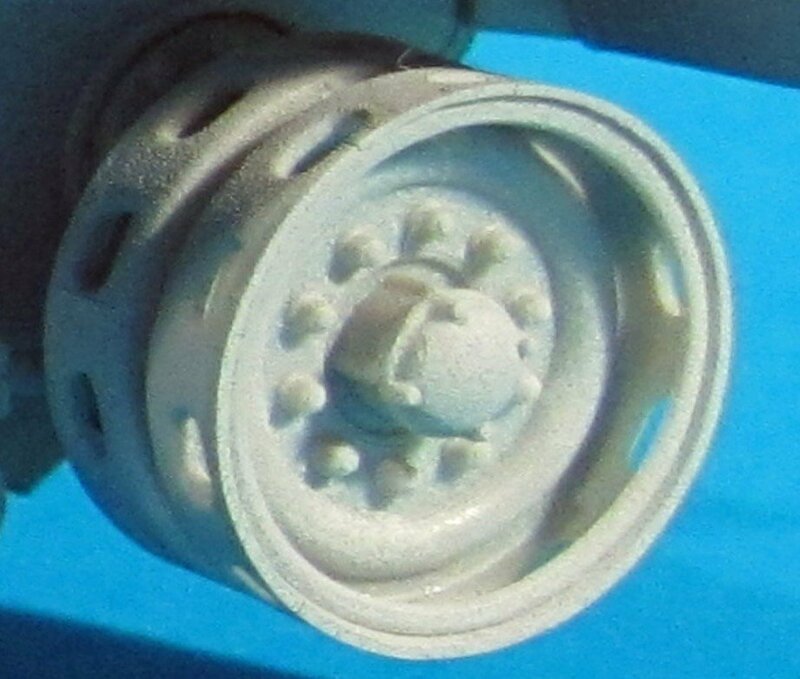 The parts are fairly easy to identify (Db sprue) and you use the alternate rear hull plate (Db 4). All other assembly is per the kit instructions. For my build, the fold-down stowage shelf was required. All the engine deck and rear hull panels really look the part when assembled. The panels also align pretty well when fitting to the hull but take your time gluing the panels in place to avoid any mistakes. Each of the track fenders consisted of two parts. Gluing was with Tamiya extra thin cement, starting a one end and working down to ensure correct aligned. Jerry cans and a first aid box were fitted as per the instructions. I also opted to use the infantry phone on my build. Again this is not documented in the instructions but the parts are easily identified on the Db sprue. Some of my researched showed them on Korean War tanks. At this stage, the instructions would have had the builder already fit the road wheels and tracks to the hull. However, these can be left off to make painting easier and fitted at the end. I left the driver’s compartment hatch cover steps until last when doing the upper hull. Each hatch cover includes a clear plastic periscope, periscope cover and a grab handle. This kit gives you the option to display the hatches in the opened or closed position, but you need to orientate the hull’s hinge point (step 12, part Ga32) so that the hatch swing arm sits down correctly. But once again, no driver compartment detail is included if the hatches are left opened. You might get away with it if you have a driver figure to obscure the nothingness. I left them closed for this build. On the right side of the hull above the track fender are the vehicle’s pioneer tools; a shovel, axe, sledge-hammer, and a pick. It looks good when assembled but getting everything to stay in place can be challenging. The kit also provides parts for a tow cable made from nylon string with styrene ends. Construction now moved onto the turret which is divided into upper and lower halves. First up is the assembly of the main gun barrel and breech. The kit provides a plastic coil spring to give the main gun a recoil action. If you want this to work make sure you avoid glue in the areas identified in the instructions. The barrel end is also bored-out. The main gun is completed with a breach guard. The gun sight and the turret mounted .30-cal machine gun are completed as sub-assemblies. The gun mantlet and forward turret part are cleaned up for assembly. The forward turret part is then sandwiched between the gun mantlet and the main gun to complete the assembly. The forward turret and main gun assembly is then attached to the lower turret assembly, which includes all the crew stations; commander, gunner and loader. A couple of different radio sets are included as well, so check you references for what you need. The turret interior is not super-detailed but provides enough if the builder wishes to leave the commander’s and loader’s hatches open and add additional details if they wish. For reviewing purposes, I gave the turret interior a coat of primer to show off what detail is provided in the kit. The main gun can also traverse up and down. The upper turret / roof section is nicely detailed. A turret stowage bin supplied for the rear of the turret. Additional turret details include a gunner’s periscope sight, a tripod mount for a .50-cal machine gun mounted behind the loader’s hatch, lifting handles, stowage points and different antenna options (again, check your references). A search light is also included but mine ended up lost in the carpet. It should be noted that the first release of the M24 by Bronco contained an error with the upper turret part. Bronco retooled this part for future editions and I can confirm that this kit has the revised tooling. The loader’s top hatch can be fixed in the open or closed position and features locking handles. The turret also includes the loader’s side hatch which can be fixed in the open or closed position. The commander's cupola is supplied as a multi-part assembly, with clear plastic parts for the viewing prisms. I left these parts out until painting was completed. The cupola hatch with periscope can also be opened or closed, and can be rotated. The whole cupola assembly is fitted without glue to the upper turret so it too can be rotated. The upper and lower halves were then glued to complete the turret assembly. The .50-cal M2 heavy machine-gun is another slide-mould part. The receiver is nicely detailed and the slide-moulding allows for a perforated barrel cooling jacket and opening for the barrel. Two barrels are included, with and without a flash suppressor. Trigger grips, receiver cover and cocking lever complete the assembly. The M2 is then fitted to a gun cradle. 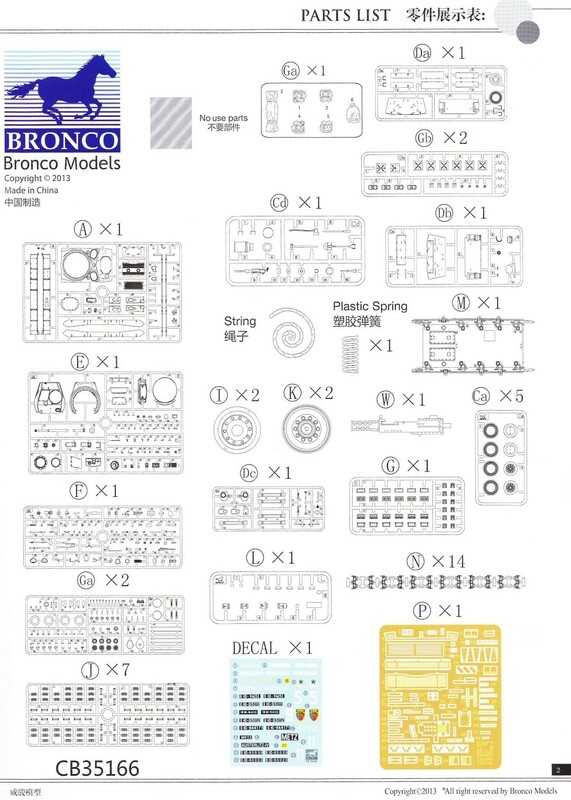 Thanks to Bronco Models for sending us this kit to build.